An diamante hinimo tikang ha tim-os nga karbon, pareho nga elemento kimikal han uring, pero matig-a ngan kristal it itsura. An diamamte amo an usa ha gititig-ahi nga butang nga nakilala han tawo. C. Even-Zohar (2007). From Mine to Mistress: Corporate Strategies and Government Policies in the International Diamond Industry (2nd ed.). Mining Journal Press. http://www.mine2mistress.com. G. Davies (1994). Properties and growth of diamond. INSPEC. ISBN 0-85296-875-2. M. O'Donoghue, M (2006). Gems. Elsevier. ISBN 0-7506-5856-8. M. O'Donoghue and L. Joyner (2003). Identification of gemstones. Great Britain: Butterworth-Heinemann. ISBN 0-7506-5512-7. A. Feldman and L.H. Robins (1991). Applications of Diamond Films and Related Materials. Elsevier. J.E. Field (1979). The Properties of Diamond. London: Academic Press. ISBN 0-12-255350-0. J.E. Field (1992). 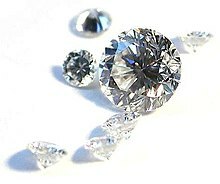 The Properties of Natural and Synthetic Diamond. London: Academic Press. ISBN 0-12-255352-7. W. Hershey (1940). The Book of Diamonds. Hearthside Press New York. ISBN 1-4179-7715-9. http://www.farlang.com/diamonds/hershey-diamond-chapters/page_001. S. Koizumi, C.E. Nebel and M. Nesladek (2008). Physics and Applications of CVD Diamond. Wiley VCH. ISBN 3-527-40801-0. http://books.google.com/?id=pRFUZdHb688C. L.S. Pan and D.R. Kani (1995). Diamond: Electronic Properties and Applications. Kluwer Academic Publishers. ISBN 0-7923-9524-7. http://books.google.com/?id=ZtfFEoXkU8wC&pg=PP1. Pagel-Theisen, Verena (2001). Diamond Grading ABC: the Manual. Antwerp: Rubin & Son. ISBN 3-9800434-6-0. R.L. Radovic, P.M. Walker and P.A. Thrower (1965). Chemistry and physics of carbon: a series of advances. New York: Marcel Dekker. ISBN 0-8247-0987-X. M. Tolkowsky (1919). Diamond Design: A Study of the Reflection and Refraction of Light in a Diamond. London: E. & F.N. Spon. http://www.folds.net/diamond/index.html. R.W. Wise (2003). Secrets of the Gem Trade: The Connoisseur's Guide to Precious Gemstones. Brunswick House Press. http://www.secretsofthegemtrade.com. A.M. Zaitsev (2001). Optical Properties of Diamond: A Data Handbook. Springer. ISBN 3-540-66582-X. http://books.google.com/?id=msU4jkdCEhIC&pg=PP1. Ini nga pakli kataposan nga ginliwat dida han 15:46, 24 Enero 2015.